Former Bahrain international Haakem al-Araibi is trapped in a detention cell in Bangkok, wanted back in is home country on trumped-up charges. Neither FIFA president Gianni Infantino or his vice president Sheikh Salman from Bahrain, who al-Araibi has said is complicit in his plight, have spoken out in defence of him. It has been a good Asian Cup for Bahrain so far. The tiny Middle Eastern kingdom has again punched above its weight to reach the group stage of Asia’s premier international competition, the continent’s equivalent of the European Championship being held right now in the United Arab Emirates. After a creditable draw with the hosts in the opening game, and after losing narrowly to Thailand, Bahrain scored an injury time penalty to send them through at India’s expense, a country of 1.4 million people dumping out a team from a country of 1.4 billion. On January 22nd they will play one of the favourites, South Korea, in their round of 16 knockout match at the Rashid Stadium in Dubai. But there will be one player, at least, who in another life would have been preparing for the biggest match of his career. 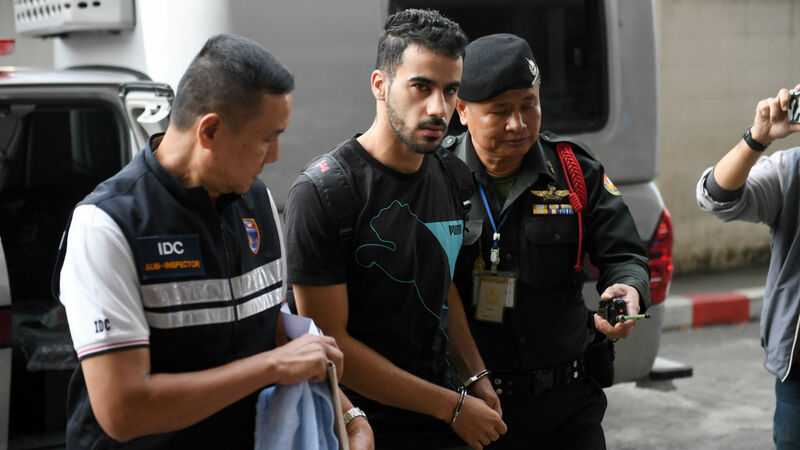 Instead, Hakeem al-Araibi, a political refugee and former defender for the Bahrain national team, is being held in a detention cell in Thailand, awaiting deportation for a crime it is unlikely he could have committed. In 2011, as the Arab Spring swept through the Middle East, Bahrain experienced its own series of protests. In February that year tens of thousands of people joined at the Pearl Roundabout in the capital Manama to protest for greater political freedoms. They were put down violently and in the aftermath dozens of footballers, sports men and women were targeted by the Bahraini authorities for exercising their right to protests. Many have alleged torture and mistreatment and several managed to flee the country to tell their stories. Hakeem al-Araibi was arrested in 2012 and accused of rioting and attacking a police station, despite the fact he playing a league game being televised live at the time. Hakeem was jailed and alleges he was tortured. But he managed to flee to Australia where he sought asylum in 2014 and rebuilt his life, playing in Australia’s state leagues. But, in November 2018, he went on a belated honeymoon with his new wife to Thailand. There he was arrested immediately and set on the path to being extradited to Bahrain where he had been found guilty, in absentia, and sentenced to ten years in jail. Bahrain had issued a “red notice” via Interpol, meaning he was to be arrested on sight. Two years ago I interviewed Hakeem al-Araibi. It was a few days before FIFA’s presidential election was about to take place. Gianni Infantino, the former UEFA general secretary, was the slight favourite but his main challenger was Sheikh Salman bin Ebrahim al Khalifa, the head of the Asian Football Confederation. Sheikh Salman, softly spoken and aloof, was also a member of Bahrain’s ruling Khalifa royal family. But for al-Araibi, and dozens of other athletes, Sheikh Salman was not the right person to head football’s global governing body. In our 90 minute interview al-Araibi laid out how he, and other footballers, had been persecuted for their beliefs and how he believed that Sheikh Salman, who was president of the Bahrain Football Association at the time of the uprising, had been complicit in their punishment: at best by failing to stand up for their rights, at worse, for being part of a committee that had been set up to identify and punish prominent sportsmen and women for protesting. Sheikh Salman, who is also a vice president of FIFA, has always denied any involvement in the identification and punishment of players..
Bahrain is a country with just over a million people, so that achievement of getting so close to the finals was remarkable. The national team had also come within one game, and one goal, of making it to the 2006 World Cup, but lost to Trinidad and Tobago. But just over a year after Adnan’s missed penalty in New Zealand, that golden generation of players was effectively disbanded. The Arab Spring came to Bahrain on Valentines Day 2011. Bahrain’s Al Khalifa royal family and the ruling elite are largely Sunni Muslim but the vast majority of the population is Shia. Thousands of mostly Shia protestors gathered at the pearl roundabout in Manama, including dozens of sporting heroes, wrestlers, handball players, and most significantly of all, several national football team players including Sayed Adnan, and the brothers A’ala and Mohamed Hubail. The peaceful protest was crushed. Activists claim four people were killed when the military rolled their tanks in to clear the makeshift camp that had been erected. As many as 30 people would be killed over that period. A military force organised by the UAE, Saudi Arabia and Qatar, who feared the spread of such regime change, rolled over the border to maintain the peace. The players survived. But they were marked men and an example was to be made of them. They were identified in a nightly sports show. A’ala phoned in and was abused by the presenter. All the players were fired from their clubs and effectively banned from the national team. The next day they were all arrested. “We saw some masked men get out of the car. They said: ‘Captain A’ala get your brother’ and we went with them,” A’ala later explained in an ESPN documentary, E:60 The Athletes of Bahrain. “They put me in the room for the beatings. One of the people who hit me said I’m going to break your legs. They knew who we were… We were forced to endure it. I had to endure it. If I didn’t something worse would have happened to me.” Eventually the Hubail brothers managed to escape to Oman, and Adnan to Australia. For almost a year after the revolution there was no football at Al Shabab club before the BFA decided to demote the club to the second division, punishment – Hakeem says – for it being a club from a Shia area heavily involved in the protests. But in the spring of 2012 the club started playing again. It was in November that year that Hakeem’s life would change forever. Al Shabab was playing a game against Busaiteen Club, at the Al Muharraq Stadium, near the airport. Meanwhile, 15 kilometres away on the other side of Manama, it was reported that the Al Khamees police station had been attacked with molotov cocktails. No one was injured but a few days later, Hakeem was arrested for the crime along with his brother Emad. “In the investigation room they were telling me that I had attacked a police station in Al Khamees on the night of November 3rd. I told them, I was playing live on TV! I have evidence!” he said. “The stadium I played in was not close to that police station. But they kept saying: ‘Don’t say that because you are a liar. You shut up. You lie.’ They kept repeating it.” The authorities alleged that Hakeem had managed to finish the game, get changed, cross the city during rush hour and then riot outside the police station in 40 minutes. It was at this point that al-Araibi alleges that he was tortured by four men, three to hold him, one to beat him whilst he was blindfolded. “In the interrogation room they asked me all the questions and said: ‘Do you need an introduction or shall we start?’ I didn’t know what they meant. They started beating me. They cared about putting no marks on me. But they were focused on my legs. They would say: ‘You are a football player and we will destroy your future.’ They were beating me on my legs every ten minutes. When it was red they would stop and let me shake the blood back into them and then I felt them beat again and again without leaving a mark.” Bahrain’s Ministry of the Interior had not replied to questions about al-Araibi’s allegations by the time of publication. By the end of November 2017 Australia had granted al-Araibi refugee status. He began rebuilding his life in Melbourne and playing football again for Pascoe Vale FC, a semi-pro club in Australia’s National Premier Leagues Victoria. He got married last year and decided to go on honeymoon in Thailand. But when he arrived he was arrested even though Interpol’s own rules prevent refugees from being issued “red notices” by the countries they flee from. He is currently in an immigration cell and could be sent back to Bahrain at any moment. It seems that the Bahraini regime has long memories and a lot of leverage. Whilst in detention Hakeem has spoken out about his ordeal and urged Infantino to intervene. He too has not made any public comment. There has also been controversy in Australia about how Hakeem came to be arrested in the first place after it was revealed that it was the Australian authorities that alerted Thailand and Bahrain to his presence in the first place. “I miss home and if they told me I could get back tomorrow I would, because it is my home,” Hakeem had said back in 2016. “I’m really happy in Australia. It feels like my second home. They have treated me really well and I am doing really well here.” The next few weeks will decide Hakeem al-Araibi’s fate. Will he be returned to Australia, or sent back to Bahrain and an uncertain future?